As a community artist, I love working with Elders and communities on projects which reclaim and pass on culture, language, story and art. When we work together we share our different skills and abilities and we always learn from each other. I have been taught possum skin cloak making and basket weaving, I’ve watched the making of beautiful contemporary shields and canoes and I have been able to draw from this richness for the illustrations in Welcome To Country. From the very beginning I looked to the paintings of ceremony by William Barak, artist, Elder and leader of the Wurundjeri. By looking at how and what he painted I was able to see what was important to him and what he wanted to pass on. I was able to see how this living culture was to continue in a contemporary way through Aunty Joy’s words in Welcome To Country. My challenge as illustrator was to find a way of showing this continuous spiritual and physical living connection to Country and Ancestors, using imagery that is accessable to a wide audience. 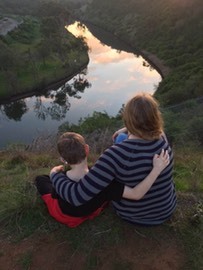 I drew from my own connections and relationships to Wurundjeri country where I grew up as a child near the Maribynong River and places where my children were born close to the Yarra river in later years. I went back to some of those special places to listen to the spirits of the Ancestors and the land. I wanted to find how they wanted to be portrayed and what they wanted to say. 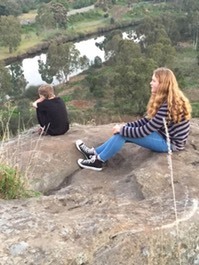 I listened to Bunjil the eagle and creator spirit, to the trees, to the river. As a child I related to the land through all of my senses and I thought I would try to recreate this sensory connection through the pictures. I remembered the rough textures of rocks and the bark of trees, the warm, wet , squishy mud under my feet, icy cold water, slippery river stones, warm fires , soft animal fur. It’s what the Old People would have felt. To do this I used layering of paint over the top of each other with the underneath layers showing through to create depth of colour and a tactile quality. I drew also from my connections as a child to vivid colours of the land, to the sounds, the vibrations, the tastes and the smells. 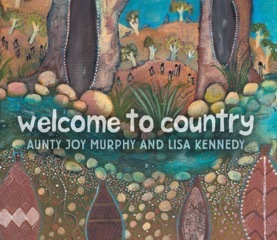 For me working on Welcome to Country was a spiritual journey with Aunty Joy Murphy and her Ancestors.